Legion is the number of photography businesses who have an excellent product and yet are struggling to make ends meet. The key to getting out of this dilemma is effective marketing. There are a number of ways to market a business – SEO, Facebook, Charity Events and mailers; however, one of the most basic is a simple and effective business card. 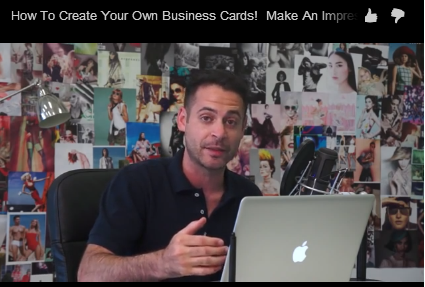 This offers tips on making an effective business card. 1. Create an in-style design. Photographers are in the image business; thus it is important that the business card not be out of date. Look at the business cards of other fashionable non-photography businesses this should give you an idea for what is currently in style. 2. Create a strong visual on the business card that creates a powerful emotional bond. Tie your services to the important things in the client’s life. 3. Before printing your cards have several people who are in the demographics of your potential clients take a look at the cards and give you feedback. You deal with your work all of the time. Sometimes it is helpful to have a fresh pair of eyes look at the work. 4. Avoid fonts that may be hard to read. It may be tempting to print in a beautiful stylish font; however, most people do not spend more than a few seconds looking at a given card. Therefore it is imperative that your card one that can easily be read quickly. 5. Make sure the basics are on the card – name, phone number, email address and website. This should go without saying, but many people do forget to do this. 6. Make sure the design is consistent with the rest of your marketing material. Remember you need a consistent message to create an effective brand. 7. Don’t make cards that are unusual in size. Remember there are a number of people who have specific containers to hold their collected business cards. If your card does not fit easily in their storage mechanism, it is likely your card will not be saved. After creating a good product, marketing is the most important factor to a successful photography business.